From left to right) Ed Magryta, Orange County’s Director of Aviation, Orange County Executive Steven M. Neuhaus, Chairman of the Legislature Steve Brescia and Town of Montgomery Supervisor Rod Winchell on Orange County Airport’s new runway. 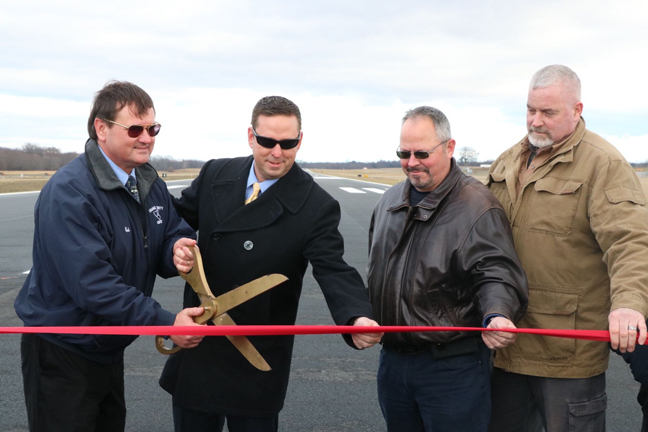 GOSHEN – Orange County Executive Steven M. Neuhaus participated in a ceremonial ribbon cutting with other local dignitaries recently to celebrate the completion of Orange County Airport’s $30 million runway realignment project. The new 5,006-foot runway is the largest project completed by Orange County Airport since the original construction of the facility by the U.S. Army in 1943. The runway project was completed on time and under budget and it was funded ninety percent federal, five percent state, and five percent county. The runway realignment project at Orange County Airport was planned more than 20 years ago. However, construction did not begin until 2014 due to required federal government and environmental approvals, and funding constraints related to such a large project. The newly constructed runway will provide the airport community, a Federal Aviation Administration (FAA)-certified obstruction free and flood mitigated takeoff and landing surface with all the required safety enhancements. The project ensures that Orange County Airport has a runway built to the highest safety standards, allowing for efficient business and recreational travel. Orange County Airport is the second-largest non-commercial/ general aviation airport in New York. With more than 170 aircraft based there and 300 daily operations, the facility serves the corporate and general aviation market in the lower Hudson Valley.